This English large sandwich or cake serving plate is by highly sought after and collected English china manufacturer Royal Albert, under their 1927 - 1935 back stamp 'Royal Albert Crown China'. It has an exceptionally pretty pattern of meadow flowers (perhaps buttercups and daisy like flowers) and grasses, which is transfer printed and coloured by hand painting. The colours of the flowers are the most wonderful bright shades of yellows and oranges and they contrast brilliantly against the creamy yellow tinted colour of the plate and the hand painted green leaves. Photo 1 most accurately reflects the creamy shade of this plate - it looks slightly paler in the other photos, as the camera was focused on picking up the bright colours and smaller pattern details. It is a pattern and style that perfectly captures a late 1920s / early 1930s English home, pre second world war. Its easy to imagine this plate on the set out kitchen table with sandwiches or slices of cake on it, all ready for tea time. The lovely floral pattern, combined with the delicate and dainty plate shape, makes this large cake/sandwich serving plate especially beautiful and elegant. I was particularly delighted to find this plate as its so beautiful and perfectly captures a warm summer's day in an English meadow. It would also make a very special and beautiful plate tea time, or to give as a very special and one-off gift. It would also stand out on your tea table and would display beautifully. This very eye catching and pretty plate, perfect for serving quintessentially English teatime cakes, such as a small mountain of scones. A lovely gift for any occasion and especially for serving cakes - large and whole or dainty and small, slices of loaf cakes, charcuterie meats, sandwiches or canapés on. It would also make a wonderful gift for a special occasion such as a birthday or for Christmas, or for someone who loves baking cakes. 9 3/4 inches (26.3cm) x 9 1/4 inches (24.7cm) at widest points. All measurements approximate. This plate is in excellent vintage condition, especially give its age. No chips, cracks or crazing to the glaze. The colours are lovely and bright and the pattern and hand painting in lovely condition. There is some wear to the rim gilding in places, which is commensurate with age and use. Any other wear is commensurate with age and any minor blemishes there may be are typical of the 1920s and 1930s manufacturing process. Please just ask if you would like any further photos. Your item will arrive carefully packaged gift wrapped prettily FOR FREE in vintage style brown paper and ribbon. If purchasing multiple items I will always combine postage wherever possible and issue a refund should any shipping overcharge arise. 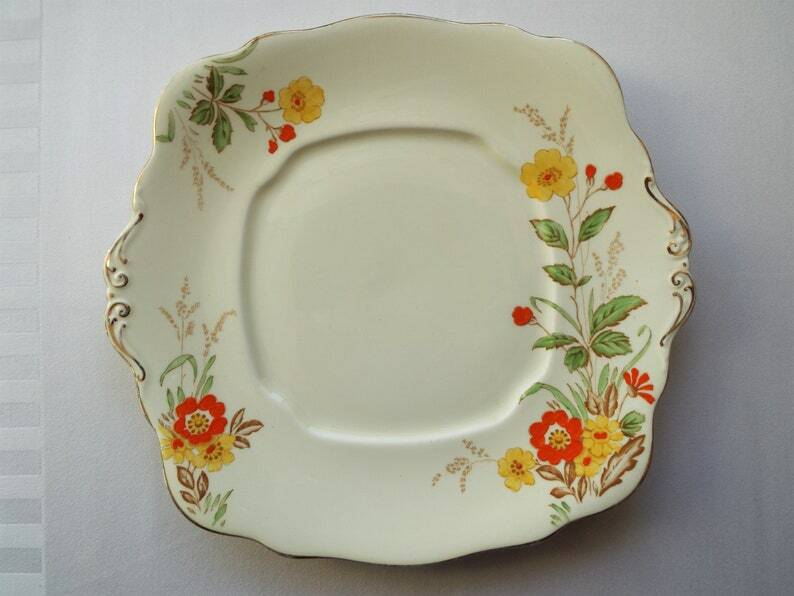 Vintage Sandwich Plate Or Large Cake Plate, 1930s Stanley China. Hand Painted Plate or Serving Platter With Cottage Garden And Path Scene. I love them. Goes nicely with my flatware. I love the vibrant colors on this gorgeous cake plate, it’s going to be the “star,” at my next tea party. Thank you for making this transaction so enjoyable. Every detail from purchase to delivery was perfect. Thank you for being a top seller, love your site. I really “lucked out,” the oak leave pattern of these prettying sugar nips is a wonderful addition to my collection. Thank you for offering so many unique items on your site. Great gift wrap, packaging and swift delivery. As described,an unusual bamboo and bird design on this pair of lovely Edwardian English sugar tongs. Gift wrapped with blue ribbon and sturdy packaging plus speedy delivery. You deserve ten stars Joanna. No item will be dispatched until payment has been received. Vintage china, tea ware items and gift sets will be dispatched within 1 - 3 working days of payment being received. Buyers are responsible for any customs and import taxes that may apply. The Afternoon Tea Set is not responsible for delays or taxes due to customs. Please notify me BEFORE ordering if you require your item for a specific date. I can the quote you all possible shipping options. No discount is available on any items, unless you use a valid coupon code at the time of purchase, or a sale price has already been applied to an item. Coupon codes are shared on The Afternoon Tea Set Facebook and Instagram accounts from time to time. Unless a customer is in possession of a coupon code, customer specific discounts are not provided on any items without prior written agreement via an Etsy conversation from The Afternoon Tea Set. The Afternoon Tea Set reserves the right to cancel any order received. If your order is cancelled, you will receive a full refund of the cost of the item, plus shipping costs. If any vintage china or item purchased from fails to meet your complete approval please contact me WITHIN 1 CALENDAR DAY of receiving it and I will do my best to help and find an outcome you are happy with. You are entitled to return an item within 14 days of receipt. It should be returned in the exact same condition as you received it and you should contact me via Etsy or email to inform me that you intend to return it, before shipping. Return postage costs are at the buyer's expense and original postage costs paid at point of purchase will not be refunded (unless you are a buyer residing in the EU). If any item arrives damaged please contact me within 24 hours. I WILL REQUIRE you to email a photo of the damage and the original packaging. I will then look at either providing an exact replacement (though this isn't always possible), a proposed alternative or a refund. I will deal with all issues and refunds promptly. If the buyer has entered an incorrect delivery address, The Afternoon Tea Set is NOT LIABLE for the costs of return shipping and will not provide a refund. It is the responsibility of the buyer to ensure they have entered the correct delivery address at the point of ordering. There are no refunds permitted when the buyer has entered an incorrect delivery address. If your item has a Royal Mail delivery reference number or tracking number, which when entered into the Royal Mail 'track and trace' function on their website (royalmail.com) shows the item was delivered or delivery was attempted, or the item is being held by a sorting/post office, then it is classed as delivered and is no longer eligible for a refund due to non-delivery or being lost in the mail. It is always recommended you check with neighbours if your parcel is showing up as 'delivered' and consider whether there are any safe places on your property that the postal service could have left it. You should then contact your local postal service/or sorting office to claim your parcel if it has not been left in a safe place or with a neighbour. The Afternoon Tea Set will inform customers if their order will require a signature upon delivery. As items are vintage, there may be some wear and tear commensurate to age - this is not a suitable reason for requesting a refund. I always state any minor issues or areas of wear. Items listed are not in newly manufactures pristine condition and never intended to be, due to The Afternoon Tea Set being a retailer of vintage items. The Afternoon Tea Set retains the right to cancel any sale. In the case of a sale cancellation, the buyer will swiftly receive a full refund, including postage. Orders (except of sale items - see third paragraph below) will be shipped within 1 to 3 working days of payment being received. (Working days here in the UK are classed as Monday to Friday and exclude weekends, bank holidays and public holidays). I never make a profit from postage and packing charges. I only charge what is necessary to cover costs, such as packing materials and travel costs to the post office, which is some distance away, as I live in a rural English village with no post office of its own. **Items included in a sale and showing a discounted price on their listing** I reserve the right to extend the 'dispatch within 1-3 working days' policy on sale items during busy sales periods, though this is a rarity. If your item is likely to be dispatched beyond the 1-3 working days period, I will keep you informed of progress and work to dispatch it as soon as possible. All purchases are packed and shipped in the order they are received. I also reserve the right to extend the 'dispatch within 1-3 working days' policy on items during exceptionally busy periods, though this is a rarity. I will always post a shop announcement and note on my shipping policy informing shoppers when the dispatch period has been temporarily extended, so that potential buyers can be aware before ordering. If your item is likely to be dispatched beyond the 1-3 working days period, I will keep you informed of progress and work to dispatch it as soon as possible. All purchases are packed and shipped in the order they are received. I should be notified of any in transit breakages or damage within 24 hours of you, or your chosen recipient, signing for it from the courier or receiving it from the post man. I WILL REQUIRE you to email a photo of any damaged or broken items and their original packaging, before I am able to discuss with you a refund or replacement as appropriate. I will contact you to let you know when your order has been dispatched. Everywhere else 1 to 3 weeks, depending on remoteness of destination. (Please note these are estimates). In the event of a poor postal service in a destination country, The Afternoon Tea Set retains the right to cancel an order to any particular country. The customer will receive a swift and full refund (including postage costs) when such a situation arises. However, the necessity to cancel an order is rare. **INTERNATIONAL ORDERS (i.e. outside the UK): I use Royal Mail Standard International airmail for all orders, unless stated otherwise on an item's listing. THIS MEANS THAT THEY ARE *NOT* TRACKED. I use this as the default in order to keep shipping costs as low as possible. However, if you require any other type of postage, e.g. tracked and/or signed for, priority shipping etc. I am happy to provide a quote - please message me for details BEFORE placing your order. All orders OVER £20, or equivalent value in the buyer's currency, WILL ONLY BE SENT TRACKED/SIGNED FOR, whether they consist of a single item, or a multiple order where the combined total value of the items ordered exceeds £20. I am not able to ask the Royal Mail to investigate shipment of parcels until 25 business days AFTER the 7th business day delivery aim has passed, in accordance with their terms. Therefore, it is not possible for me to class an order as undelivered until after this time frame set by Royal Mail has passed. However, please rest assured that non-deliveries are extremely rare, so please be patient, especially at busy holiday times. I will always do my best to help if you suspect your parcel could be late. Please note that any parcel sent outside of the EU will have a customs label listing the item and price. This is a legal requirement. **UK ORDERS: orders will be sent using Royal Mail standard second class, unless otherwise specifically stated on the shipping information against an individual item. You can upgrade to first class shipping at the checkout, if the option is available for an item. If you would like recorded, tracked or next day/guaranteed delivery, please contact me BEFORE ordering. All orders of OVER £20 WILL ONLY BE SENT TRACKED/SIGNED FOR, whether they consist of a single item, or a multiple order where the combined total value of the items ordered exceeds £20. I am unable to ask the Royal Mail to investigate shipment of parcels until 15 business days AFTER the 3rd business day delivery aim has passed, in accordance with their terms. Therefore, it is not possible for me to class an order as undelivered until after this time frame set by Royal Mail has passed. However, please rest assured that non-deliveries are extremely rare, so please be patient, especially at busy holiday times. I will always do my best to help if you suspect your parcel could be late. PLEASE NOTE FOR MULTIPLE/COMBINED ORDERS WEIGHING MORE THAN 2kg INTERNATIONAL & DOMESTIC: I will inform you ASAP if your order totals more than 2kg (normally 3 vintage china listings or more) and combined shipping may not be possible. For large multiple orders I reserve the right to ship orders in more than one parcel, for safe packaging and cost effective purposes. Rest assured that if this is done, it is due to it being the most cost effective and safe way to get your items to you - no one wants to receive broken goods. I will inform you if your order is to be shipped in more than one parcel. If you would like a shipping quote for a multiple order of more than one item please just ask BEFORE ordering. Please note, it is not possible to reserve items for first time customers, I'm very sorry. I can only reserve an item for a repeat customer, for a strict 24 hour period only. All orders are gift wrapped in vintage style brown paper and pretty ribbon as standard. There is no extra charge for this. Christmas gift wrapping can also be selected for an order at the checkout. I reuse packaging boxes and filling materials wherever possible, for environmental reasons and to keep costs down, but please rest assured that your order will still look smartly gift wrapped. Will my item be sent 'tracked'? Items priced at over £20, or equivalent value in the customer's currency, will only be sent 'tracked and/or signed for' to addresses outside of the U.K, (depending on availability in the destination country), or 'signed for' to UK addresses. Where this is the case, it will be stated in the item's description, under the 'Packaging and Shipping' section. Orders of multiple items that total more than £20 in value (or equivalent amount in the customer's currency) will also only be sent 'tracked and/or signed for' internationally, or 'signed for' to UK addresses.